“There is a drawer at one end of the makura in which you will find tobacco extremely fine cut and of attenuated flavor. You may take ippuku – one puff as the Japanese say – with small danger of nervous prostration. There may be one or two kiseru, or pipes, in the drawer. If not, surely there are several on the tray beside the tabako ban, the square little rosewood box with the earthenware hibachi [brazier] in it and the haifuki, as the bamboo tube is called which is a combination of ash receiver and cuspidor. Bits of burning charcoal are in the hibachi for lighting your pipe. The haifuki is for ashes, burnt matches, and the other uses of a cuspidor. From the wiki: “The tobacco industry in Japan can be traced back to 1869, when Yasugoro Tsuchida, a Tokyo merchant, began the production of rolled cigarettes on a small scale. This represented the introduction of locally produced cigarettes and came less than 20 years after the first introduction of cigarettes to Japan as imports from Britain and the United States. “In 1898, a tobacco bureau was established within the Ministry of Finance to operate this monopoly. In 1905, a salt monopoly was added to the bureau’s responsibilities. 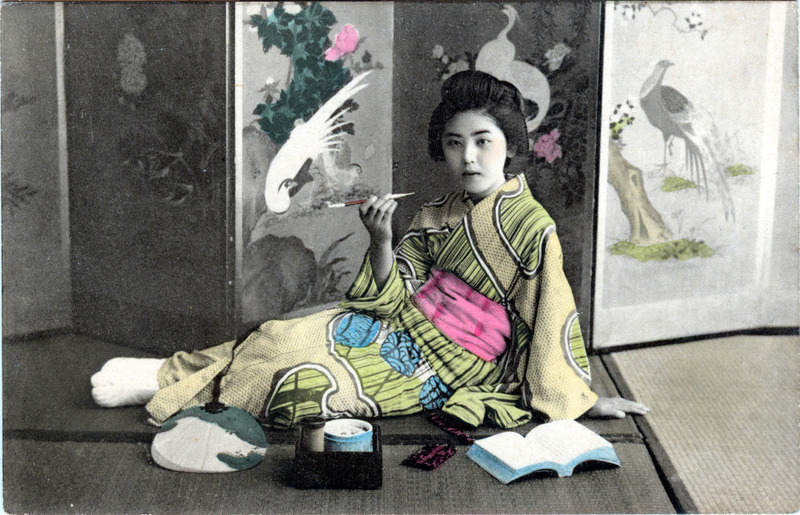 The bureau began marketing Cherry cigarettes in 1904, a brand still sold in Japan. In 1906, it began producing and selling its most popular brand at the time, Golden Bat. In 1900 Japan became one of the world’s first countries to pass a law forbidding the consumption of cigarettes by minors – those under the age of 18. For the next 30 years tobacco and salt production in Japan continued to be administered by this bureau within the Ministry of Finance. Profits went directly into state coffers and were regarded as a kind of tax by the authorities. The prices charged by the government on tobacco were relatively low while those on salt were minimal, and the monopoly was in some ways used as a means of controlling the nation’s economy, providing a regular source of income for the government. “Of the habitual smokers of Golden Bat, there were some famous writers, and the name of ‘Bat’ appears in their literary works. Well known story, writers Ryūnosuke Akutagawa, Osamu Dazai and Chūya Nakahara loved to smoke Golden Bat. Hyakken Uchida liked high-quality cigarettes, such as ‘Asahi’, ‘Peace’, but he mentioned ‘Bat’ as the cigarette he desired to smoke sometimes. The naturalist, Minakata Kumagusu also smoked Golden Bat, and he used its box as a specimen case of a slime germ he collected.